Saw the Met's 2008 production of Salome at the Summer HD Festival last night. Really wanted to hear it after reading about the rapturous response of the audience to the opera's premiere in Alex Ross's book The Rest Is Noise, and after loving The Rosenkavelier heard at another Summer HD Festival. Karita Mattila was an electrifying Salome. She was no girl, but her girlish manner was very much a part of her interpretation of the daughter of Herodias. In her depiction, Salome was a spoiled and wilful child of privilege, a seductress already confident of her alluring power over men. All of which made her attraction to Jochanaan, the desert prophet, so much more unlikely and yet inevitable. She must have what she could not have. Compared to the indecisive Herod (Kim Begley) and her washed-up mother (Ildikó Komlósi), Salome was unstoppable because she was willing to die to get what she wanted. As she sang, the mystery of love is stronger than the mystery of death. Last Friday, after having dinner at Buvette (French and Italian tapas place in Greenwich Village), I watched the film Teddy Bear with WL, DM and BCH at Film Forum. Directed and co-written by Mads Matthiesen, the movie followed a shy bodybuilder's search for love. Dennis had to leave the house in the Copenhagen suburb that he shared with his possessive mother for Thailand where he found true love after a series of mistrials. The ensemble acting was terrific. Kim Kold was an endearing boy in a superman's body. Elsebeth Steentoft brought a frightening intensity to her role as the dominating mother. She was the emotional blackhole that nothing could fill. As true love Toi, Lamaiporn Hougaard was sweet but not saccharine. Her spirit rippled across her face when she was crossed. It was a good idea to travel elsewhere while visiting Singapore. GH and I flew to Hong Kong on August 13 for four days, and then to Bali immediately for another four days. Four days are not really enough time to visit both, but that time was all we had. Visiting these two places one after another accentuated their differences for us. This was the longest time that I have ever spent in Singapore since leaving it. I will probably come back to this month from time to time, but I just want to remember, for now, the two readings I did there. 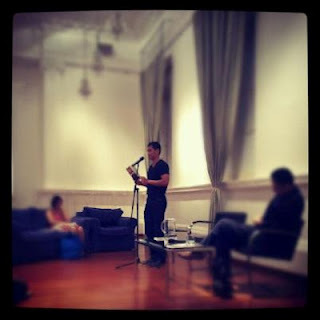 Paul Tan from the National Arts Council referred me to Paul Rozario at The Arts House. Paul R. was extremely friendly and helpful in setting up the reading, which took place on August 4, in the former Ministers' Lounge in the old Parliament House. William Phuan, the director of The Arts House, was present throughout the evening too.